Jeff Attinella gets ready for a shot on goal. Rivalry matches often defy convention because they don't require stakes or consequences for the participants. Current records, streaks, form, injury status - none of that matters when a club faces their most fierce and despised opponent, and it's because of that where the derby matches take on a complexion of their own. 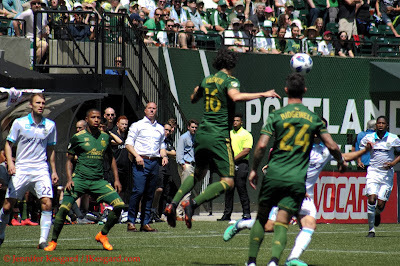 For the Portland Timbers, they had played some of their best soccer in 2018 to date leading up to hosting their arch rival from Washington, the Seattle Sounders FC. In an odd twist, the teams would be meeting on May 13, 2018 for the 100th time throughout various leagues and competitions and there was plenty of fanfare associated with the rivalry hitting the century mark. However, because of the unbalance schedule for MLS in 2018 when Los Angeles Football Club joined, this match would have no bearing on the 2018 Cascadia Cup race. While the opposing supporters were certainly giving it their best, the combatants in the match struggled to find anything that would work consistently until the home side finally broke free with a late goal from Sebastian Blanco. This led to a wild, intense finish but Blanco's 85th minute tally would end up being the only goal of the day as the Timbers secured a 1 to 0 win for their 3rd consecutive shut out win. Portland had last accomplished the 3 shutout wins in a row back in 2007, so it had been a while; but it's very apparent the defense has started to find their confidence through this stretch. Just over a month ago, Portland lost in Orlando City when the home side scored 3 goals in the final 10 minutes to steal a victory, but since that dramatic result, the Timbers have won 4 in a row starting with a gut check win against Minnesota United to start their home slate of matches. Timbers Coach Gio Savarese has made some dramatic changes in the lineup since that win by bringing in goalkeeper Jeff Attinella and defender Liam Ridgewell for the match against New York, and mixing up the attacking philosophy. The tactics since this changeover have resulted in 3 wins by shutout with 5 total goals highlighted by an improving defense and an opportunistic offense. Attinella and Ridgewell would again get the call to start against Seattle in defense alongside compatriots Larrys Mabiala, Alvas Powell and Zarek Valentin. Savarese would change up the attack by going with the Christmas Tree formation of 3 central midfielders, 2 attacking midfielders and a lone striker. To that end, it was Diego Chara, Cristhian Paredes and Andy Polo playing defense mids, Blanco and Diego Valeri slotted as attacking mids and Fanendo Adi as the forward. In this approach, it would be imperative to see Polo, Valentin and Powell get forward as much as possible to help the offense, but they would need to drop back quickly if a counter attack arose. Considering this approach worked so well versus NYCFC, it seemed like a good move to bring it back for another run against an extremely depleted Sounders side. Seattle had drawn against Columbus at home on May 6 in a scoreless snooze fest before playing their first MLS midweek match in Toronto FC against the defending champions. They shocked many experts by beating TFC 2 to 1 before heading back to the Pacific Northwest to play their rivals to the South. Sounders FC Coach Brian Schmetzer would have to dig deep on his bench to find a lineup with six key players - Will Bruin, Waylon Francis, Nicolas Lodiero, Jordan Morris, Roman Torres and Victor Rodriguez - unavailable, and his tasks got worse when it was discovered that Osvaldo Alonzo would not be ready to play either. Seattle still had Stefan Frei in goal, who has been solid at times, Chad Marshall, the steady and insightful defender, and Cristian Roldan, who has quietly become a solid playmaking force. The mercurial one, Clint Dempsey, was also healthy and available, and the Sounders have brought in Roldan's brother, Alex, who has provided some good depth as well. Schmetzer did employ what attacking options he had available in his starting line up with Dempsey, the Roldans and forward Jordy Delem, but the approach would be to leave midfielders Gunnar Svensson and Mangus Eikrem at home in the middle. When attacking, defenders Kelvin Leerdam and Nouhou Tolo would move forward as much as possible, but in defense, they would drop back and bunker in front of Frei. It was very much a "park the bus" approach, but considering Seattle had played midweek already, you could understand a more conservative approach. And despite being the 100th such meeting of the sides, there were really no stakes to play for outside of pride. 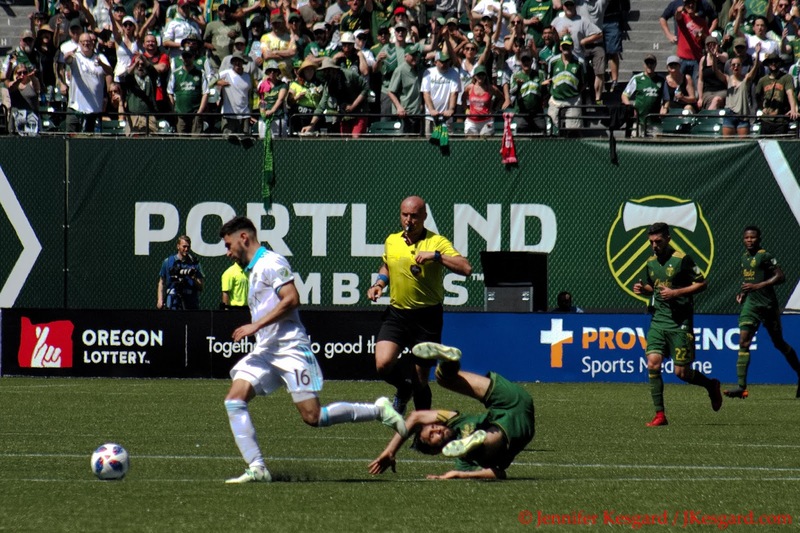 MLS has been following an unbalanced schedule for several years and 2018 was no exception, but in this year, the unbalanced impacted the Cascadia Cup. While the Timbers and Sounders would play each other 3 times in the regular season, the Sounders and Timbers only play the Vancouver Whitecaps 2 times in 2018 - thus throwing off the balance. The Cascadia Cup Council made up of representatives of the varied supporters groups (Timbers Army, Southsiders, Emerald City Supporters/Gorilla FC to name a few) decided to only count the last 2 Timbers-Sounders meetings, so this result would not affect the status of the Cup. 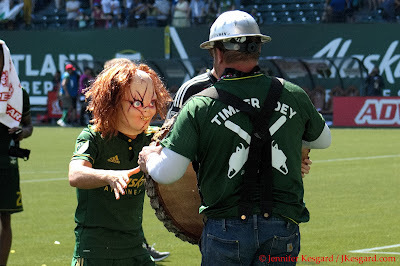 For the current holders of said cup, the Timbers Army, this meant having to wait for June 30th when the Timbers travel north to start officially defending their honor. But as previously mentioned, rivalries don't depend so much on stakes and that was apparent in arriving to the match 2 hours ahead of kick to find both supporters groups already stuck in song and getting ready for the later events. After a slow start, the physicality picked up greatly in this match. For all the intensity, however, the teams really started out very slow and cautious during the first half. For the Sounders, they had 2 near misses from Tolo and their best chance of the first 45 was a drop pass from A. Roldan to the feet of a charging Dempsey at the top of the box in the 44th minute with space to work. Number 2 pulled his shot way wide of the right post attacking the South Deck, but that was essentially the most credible threat. For the Timbers, Valeri, Blanco and Adi had good chances - Adi was just offside in the 15th minute by half a step clear on goal, and his 32nd minute shot off a cross was pulled clear - and Polo was creating lots of space for himself, but the most notable events involved tackles. In the 34th minute, Delem slammed into Valeri's leg from behind on a late tackle to earn the game's first caution, but Center Official Robert Sibiga left the call at yellow despite the force of the tackle and coming from behind. The intensity of the match picked up from there as Blanco was nearly booked in the 36th minute for a hard foul on A. Roldan and Ridgewell earned a booking for a cynical foul on a breakaway in the 44th minute that was considerably forceful and could have earned a harsher penalty. Sibiga didn't interact with VAR in any of these instances, but it was very apparent the teams were starting to find their chippy side. Seattle's conservative strategy continued after the break as the visitors logged just 2 shots in the second half with nothing official after the 63rd minute. Tolo's shot in the 48th minute forced Attinella to make a quality catch in traffic, but outside of that, the offense in the second half belonged to Portland. Valeri and Adi worked a lovely one-two drop pass near the box that put Diego free on goal in the 59th minute, but Svensson was able to deflect the shot away at the very last moment with Frei out of position. Polo and Valentin worked to create space in the 68th minute with Polo putting a curling shot towards Frei that forced a save from the Sounders keeper, but with the minutes ticking away, it appeared that the Sounders might steal a point as the Timbers couldn't find a goal. Mabiala missed a header in the 84th minute off a corner kick that looked like the last real chance of the day until substitute Samuel Armenteros created the game winning goal. Armenteros entered for Adi in the 79th minute and tried to earn a penalty in the 80th minute when Chara put a pass to Samuel to the top of the box with Marshall nearby. The Seattle centerback and Armenteros collided accidentally going for the ball in the box, and while there were calls for a penalty, Sibiga waived them off. This is comical. Yet very scary at the same time. Armenteros and Blanco found their space in the 86th minute when Samuel captured the ball in traffic near the top of the box with 3 defenders and Blanco nearby. In a wonderful execution, Armenteros dropped a pass to Blanco in time and onside with the defenders slow to react, and by the time Sebastian found the ball, he was alone on goal with just Frei to stop him. A deft spinning shot to the left post was created by Blanco, and Frei was helpless to watch the ball spin just inside the post for the goal. The match then went into overdrive with the Sounders throwing players forward, and with an injury to defender Kim Kee-Hee in the second half, the Timbers had to navigate through 6 minutes of called stoppage time and a VAR review of a foul on Blanco when he took out Delem with a deft shoulder to shoulder bump. Sibiga didn't discipline Blanco any more than the yellow, but with stoppage time hitting nearly 10 minutes before it was finally done, the Timbers could breath a sigh of relief to post the victory. The post match celebration saw Blanco put on a mask of Chucky, the character from the Child's Play series of movies, to receive his log slice, but we also learned that this was Blanco's nickname from his playing days in Argentina. Portland won't get that much rest as they continue their home stand on Saturday, May 19 in hosting LAFC before they travel to Colorado to play the Rapids on May 26. 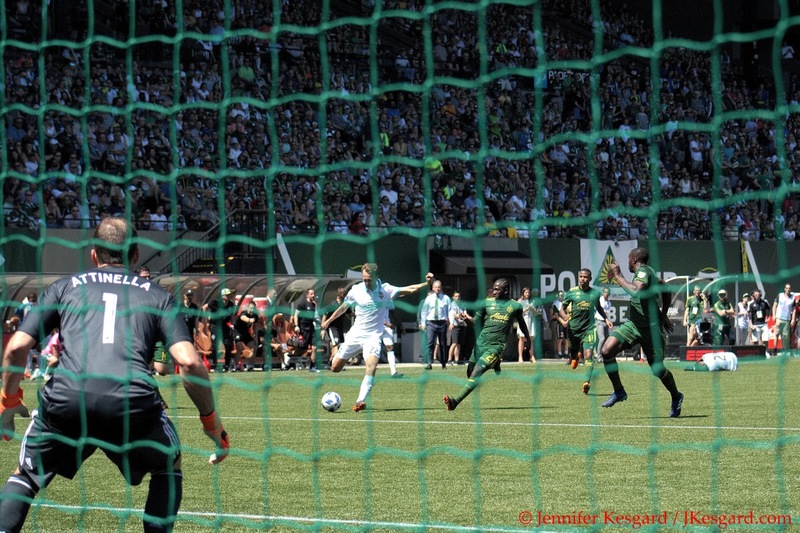 Portland then gets another back to back home matches as the Galaxy visit Providence Park on Saturday, June 2 followed by a visit from Sporting Kansas City on June 9. The Timbers then get a break for most of June for World Cup 2018 before they make a tough road trip to Atlanta on June 24 and the Seattle match on June 30th. There is also U.S. Open Cup matches forthcoming, as rumors put the Timbers' opening match for the annual competition sometime in mid June as well. But for now, the supporters and the cats can celebrate a hard fought victory against the invaders from the North.